Erin Mickelson is a book artist working under the imprint Broken Cloud Press. Her work includes artist books, bookbinding, unique & edition letterpress printing, and book layout & design. In my artist books, I move beyond conventional forms of narrative, communication, and language. Through content, form, and structure, my books engage the reader both conceptually and kinetically in often unexpected ways. I like to include digital media and processes or odd bits of technology in my work (tablets, projectors, sound modules, etc.) 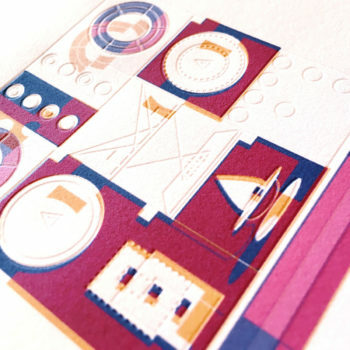 as well as hand-binding techniques and letterpress printing—thus creating an object and experience that is at once traditional and contemporary. I would use this funding to join MAKE Santa Fe, the community workspace in the Meow Wolf Art Complex. Access to equipment like a laser cutter, a 3D printer, and a CNC router would allow me to create innovative artist books in larger editions than I am currently capable of making. Being a member of MAKE Santa Fe would also allow me to experience the knowledge, inspiration, and support of a community of makers. Working from a home studio is wonderful and fulfilling, but it can also be isolating at times. In addition, I would use this funding to purchase a self-inking letterpress. My current press requires manual inking, which makes editioning books a slow, tedious process. A self-inking press would open up many more possibilities for my artist books. To learn more about Erin Mickelson click here.